Suitable for adult cats from 1 to 6 years of age. High quality lean proteins assist in maintaining ideal body condition. Healthy, gentle digestion for easy litter box clean-up, and reduced sulphur compounds in stool. The cat food consists of 52% less fat and 21% less calories which assists in maintaining healthy weight of the adult indoor cat. Unique fibre technology effectively reduces hairballs. Premium dry cat food made with no artificial colours, flavours, or preservatives. 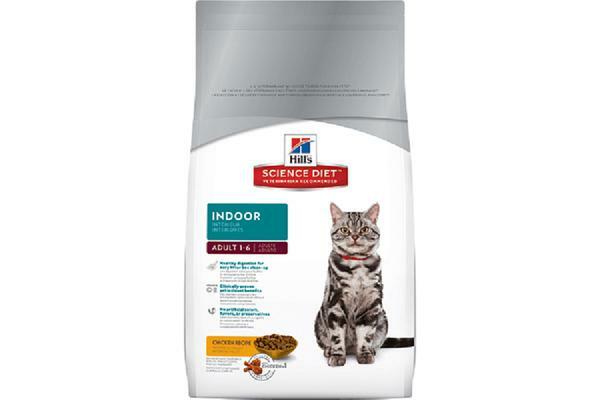 Complete daily nutrition and essential ingredients for nourishing the indoor cat’s skin and coat. Clinically proven antioxidant blend for immune system support. For a premium cat food designed specially to support the unique needs of today’s indoor cats, choose Hills Science Diet Feline Indoor Cat! Ingredients: Chicken. Whole Grain Wheat. Corn Gluten Meal. Pork Fat. Powdered Cellulose. Chicken Meal. Wheat Gluten. Dried Beet Pulp. Chicken Liver Flavour. Soybean Oil. Lactic Acid. Fish Oil. Choline Chloride. Potassium Chloride. Calcium Sulfate. L-Lysine. Vitamins (Vitamin E Supplement. L-Ascorbyl-2-Polyphosphate (source of Vitamin C). Niacin Supplement. Thiamine Mononitrate. Vitamin A Supplement. Calcium Pantothenate. Riboflavin Supplement. Biotin. Vitamin B12 Supplement. Pyridoxine Hydrochloride. Folic Acid. Vitamin D3 Supplement). Taurine. Iodized Salt. L-Carnitine. Minerals (Ferrous Sulfate. Zinc Oxide. Copper Sulfate. Manganous Oxide. Calcium Iodate. Sodium Selenite). Mixed Tocopherols for freshness. Natural Flavours. Green Peas. Apples. Cranberries. Carrots. Broccoli. Beta-Carotene. Hill’s employs more than 150 veterinarians, Ph.D. nutritionists and food scientists who work every day around the world to create new products and improve existing ones that will help your pet live a long, healthy and full life. Hill’s scientists author more than 50 research papers and textbook chapters each year and teach at leading schools of veterinary medicine all over the world. All that knowledge and expertise is put into making the best pet food possible. Their dog and cat food, is, formulated for the optimal balance of nutrients and best taste. Hill’s appreciates that, the best nutrition for your pet not only meets nutritional needs, but also avoids excess nutrients, such as fat and salt, that can be harmful over time. Hill’s long-term investment in learning, technology and talented scientists has helped, them develop industry-leading product innovations, including the most extensive range of clinical nutrition products for sick, at-risk and healthy pets. Hill’s, products have been trusted by millions of pet owners since 1948, and, today, veterinarians around the world recommend and feed their own pets Hill’s products.